Server / Telecommunications / Networking / Data-Center Equipment Racks for IT Infrastructure. 4-post racks, also known as 'server racks' or 'equipment racks' are enclosed cabinets or open frames designed primarily for mounting servers, storage devices, Blades, UPSs and other 'heavy-duty' IT-infrastructure equipment that require 4-point mounting. Plyant CQ – Extra deep (42" and 48" deep), extra rigid (reinforced and fully-welded structure) enclosed/secured cabinets designed for data-center applications offering exceptional utility combined with a solid structure, superb cable-management, and a variety of mix-and-match door- top- and cooling-options. 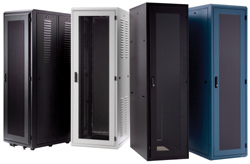 Plyant CL – Extensively-customized line of enclosed/secured cabinets for server/telecommunications/networking applications with a wealth of mix-and-match options for doors, tops, bottoms, and side-panels, and excellent cable access and management capability at an attractive price-point. Plyant Low-Boy – Designed for small installations where securing IT equipment is required in a cabinet that offers all the options, bells and whistles available in larger racks despite its small size. Plyant Low-Boy 13U cabinet is only 30-inches high, yet offers ample depth (available 30") for mounting servers and other deep IT equipment. Casit 1100 – Ideal for under-counter applications, small office and remote branch office deployment where securing 4-post IT equipment is needed at a low price-point - Casit 1100 11U enclosure is only 26-inches high on its casters. Casit 1100 is ideal for environments where space is limited. It's a compelling alternative to pressboard RMU boxes used in broadcast environments; it's easily wheels under a desk/counter; it's available with or without front and back doors. Servit – An inexpensive alternative to cabinets – A family of full-height open 4-post racks offered in a variety of available depths that ship UPS and get installed on-site, with options to support integrated cable management and power distribution.